Having a tough time choosing between Ozzfest and Knotfest? 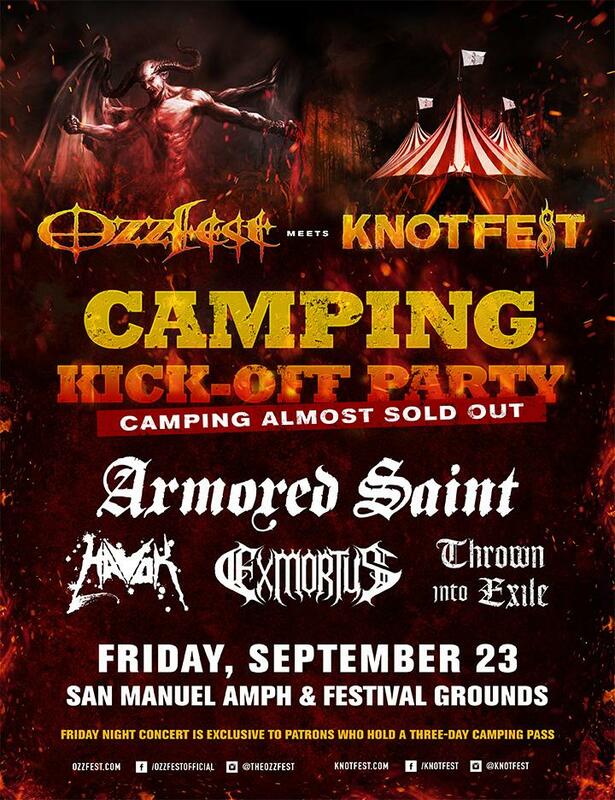 Well worry no longer because the two metal festivals have merged into one mega-festival: Ozzfest Meets Knotfest. The one-weekend event takes place Saturday, September 24 and Sunday, September 25 at the San Manuel Ampitheater and Festival Grounds in San Bernardino, CA. On Saturday the Ozzfest performers will take the stage while Sunday is slated to feature performances from the Knotfest lineup. Ozzfest is currently celebrating its 20th anniversary and includes artists like nu-metal kingpins Disturbed, prog-metal band Opeth, thrash legends Megadeth, melodic death-metalheads Children of Bodom, metalcore pioneers Hatebreed – and of course Black Sabbath. 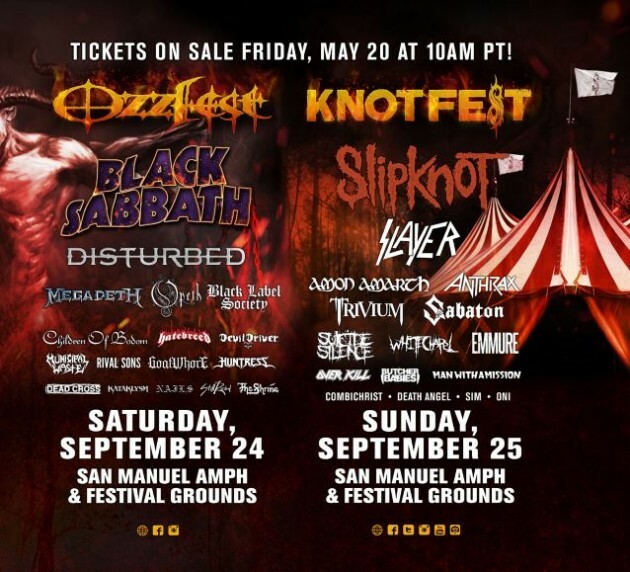 Meanwhile, Knotfest is the Slipknot-curated metal event that got its start back in 2012. This year’s lineup includes Slipknot plus Slayer, Amon Amarth, Anthrax, White Chapel and Death Angel. The lineup and details around the super-festival were announced by Ozzy Osbourne himself at a press conference held at the Hollywood Palladium. The conference included a movie screening and a Q & A session featuring artists from the festival’s lineup. On hand at the presser were members of Slipknot, vocalist Corey Taylor and M. Shawn Crahan, better known by Slipknot fans as Clown were on hand to . As the final tour for Black Sabbath, this appearance at Ozzfest Meets Knotfest marks the final Southern California performance for the metal legends. It is a fitting location for the band to conclude their reign atop the metal world – the San Manuel Ampitheater and Festival Grounds is in fact where Ozzfest got its start back in 1996. UPDATE (7/5/2016): The Ozzfest portion of Ozzfest Meets Knotfest has added Suicidal Tendencies to the lineup. The band will perform on the Lemmy Stage along with Hatebreed, DevilDriver and more. 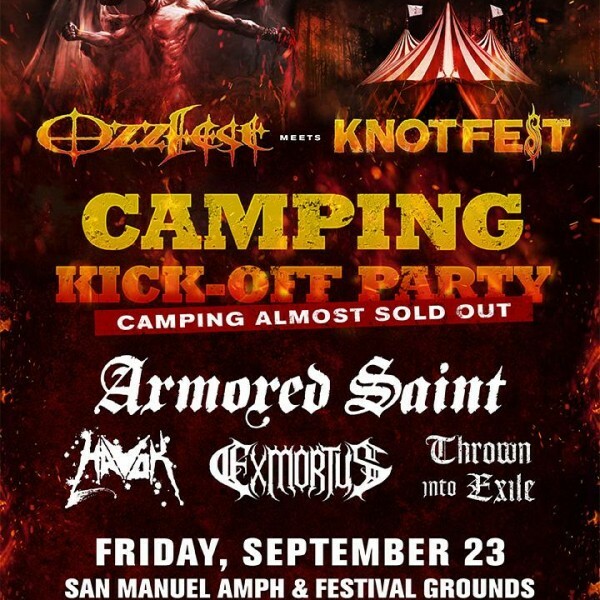 UPDATE (8/4/2016): Ozzfest meets Knotfest has announced a free Friday night kick-off party for weekend campers. The pre-party will include performances by artists such as Armored Saint, Havok, Exmortus and Thrown Into Exile.